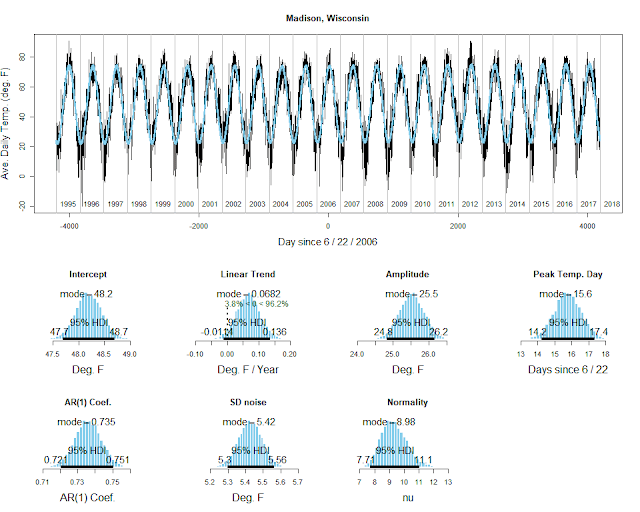 In a previous post from six years ago, I fit a sinusoidal trend, with auto-regressive component, to daily temperature data. (Spoiler alert: It's still getting warmer.) Recently I've received inquiries about the script for that analysis. I disinterred the ancient script, updated it, and grabbed more recent temperature data. The script and data file are linked below. As you can see from the plot (above), the slope of the linear spine of the sinusoidal variation is 0.068 degrees Fahrenheit per year. The 95% HDI on the estimate spans zero, just as it did with the smaller data set in the previous post from six years ago. But I'm pretty sure that if this city were put into a big hierarchical model with lots of other cities across the globe, the high-level estimate of slope on the linear spine would be clearly greater than zero. But evidence for global warming is not the point of this post. The point is to link the full script and data file. 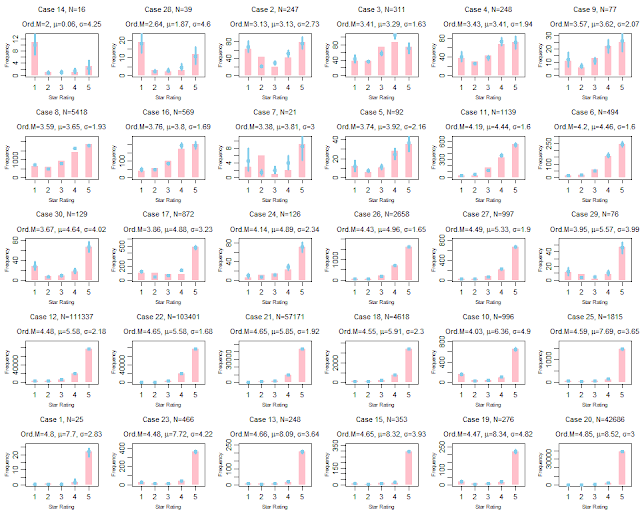 Here they are: R script; data. Hope this is helpful. Which movie (treatment, group) is better? Opposite conclusions from different models. Treating ordinal values as if they were numeric can lead to misinterpretations. Ordinal values do not indicate equal distances between their levels, nor equal coverage of each level. 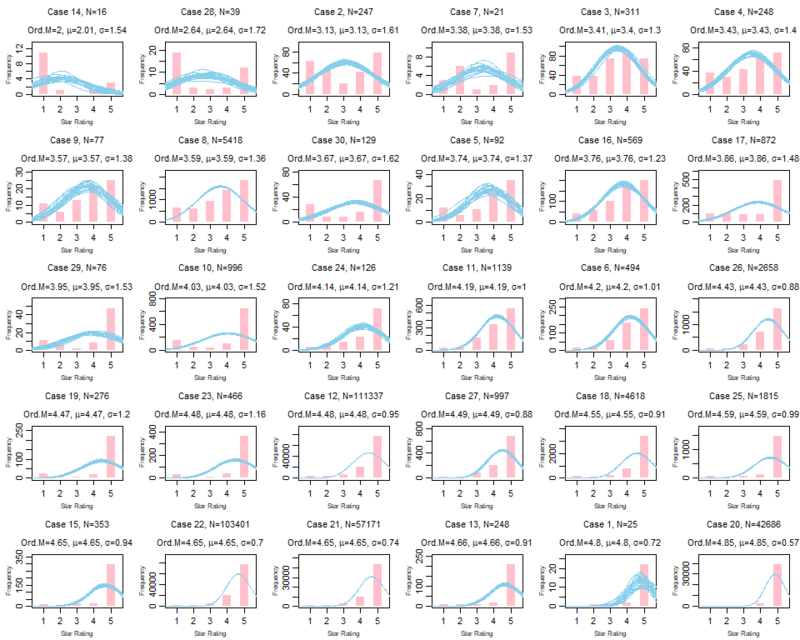 The conventional t test (and ANOVA and least-squares regression, etc.) 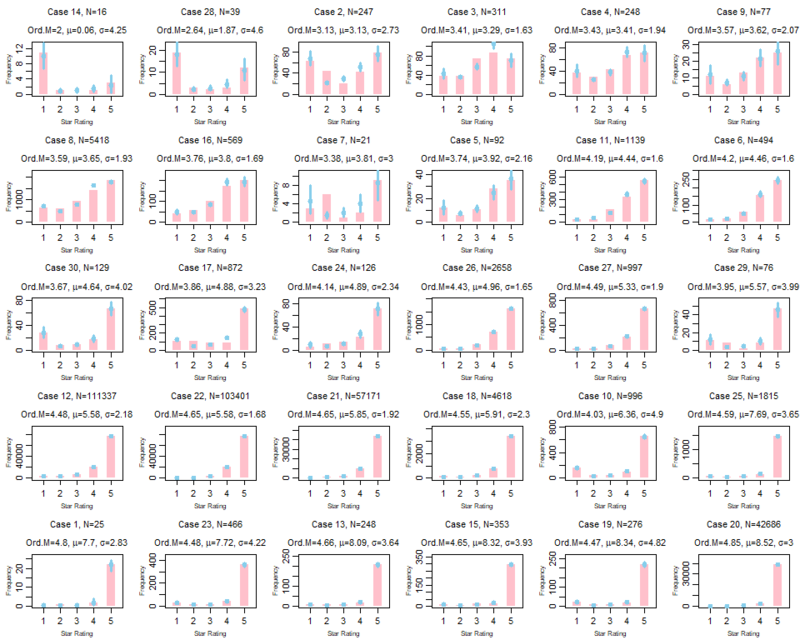 assumes the data are metric values normally distributed around the model's predicted values. 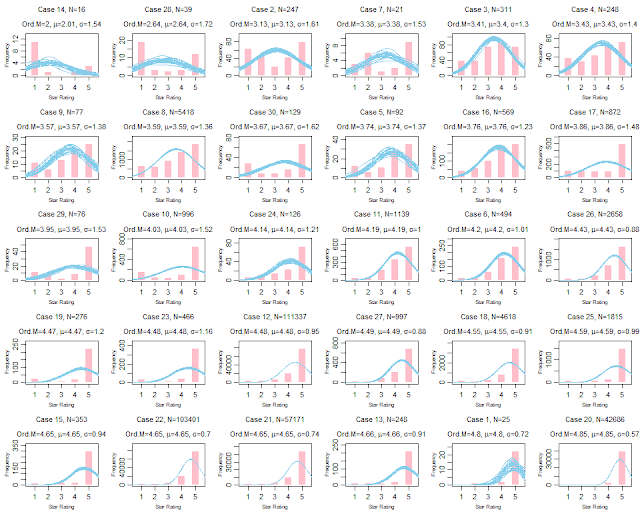 But obviously ordinal data are not normally distributed metric values. We surveyed all articles in the Journal of Personality and Social Psychology(JPSP), Psychological Science (PS), and the Journal of Experimental Psychology: General (JEP:G) that mentioned the term “Likert,” and found that 100% of the articles that analyzed ordinal data did so using a metric model. We present novel evidence that analyzing ordinal data as if they were metric can systematically lead to errors. We demonstrate false alarms (i.e., detecting an effect where none exists, Type I errors) and failures to detect effects (i.e., loss of power, Type II errors). 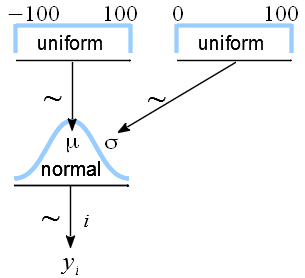 We demonstrate systematic inversions of effects, for which treating ordinal data as metric indicates the opposite ordering of means than the true ordering of means. We show the same problems — false alarms, misses, and inversions — for interactions in factorial designs and for trend analyses in regression. We demonstrate that averaging across multiple ordinal measurements does not solve or even ameliorate these problems. A central contribution is a graphical explanation of how and when the misrepresentations occur. 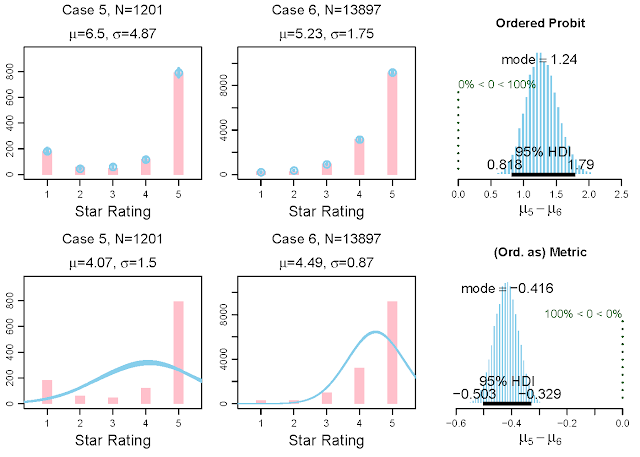 Moreover, we point out that there is no sure-fire way to detect these problems by treating the ordinal values as metric, and instead we advocate use of ordered-probit models (or similar) because they will better describe the data. Finally, although frequentist approaches to some ordered-probit models are available, we use Bayesian methods because of their flexibility in specifying models and their richness and accuracy in providing parameter estimates. 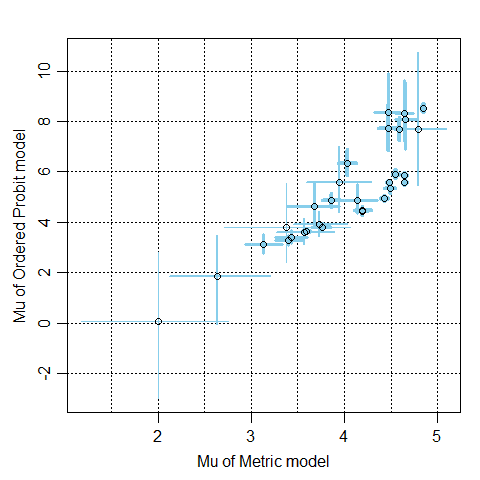 An R script is provided for running an analysis that compares ordered-probit and metric models. Fig. 4. 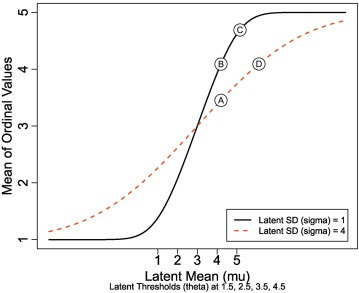 Ordinal mean as a function of latent mean (mu) and SD (sigma). Groups marked Ⓐ and Ⓑ illustrate a false alarm (Type I error) for which the underlying means are exactly equal but the ordinal means are very different. Groups marked Ⓑ and Ⓓ illustrate a miss (Type II error) for which the underlying means are quite different but the ordinal means are exactly equal. Groups marked Ⓒ and Ⓓ illustrate an inversion for which the underlying means have μD > μC but the ordinal means incorrectly have μC > μD. 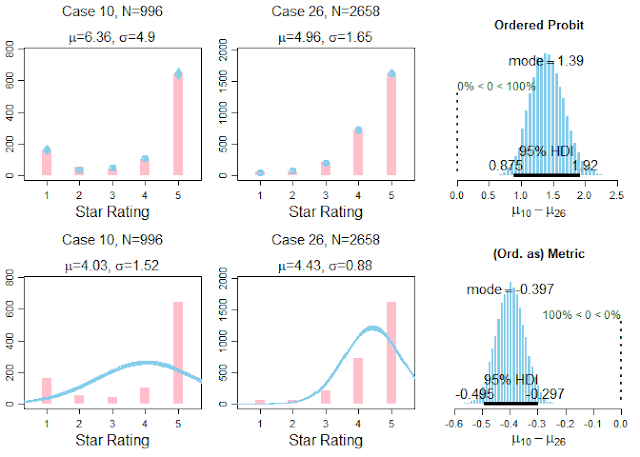 Just published: "Rejecting or Accepting Parameter Values in Bayesian Estimation"
Just published: "Rejecting or Accepting Parameter Values in Bayesian Estimation" in the journal, Advances in Methods and Practices in Psychological Science. 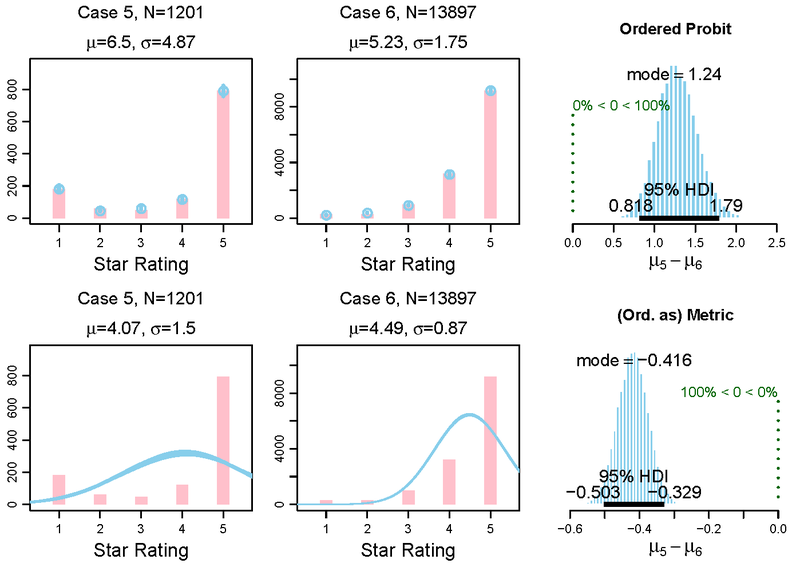 Abstract: This article explains a decision rule that uses Bayesian posterior distributions as the basis for accepting or rejecting null values of parameters. This decision rule focuses on the range of plausible values indicated by the highest density interval of the posterior distribution and the relation between this range and a region of practical equivalence (ROPE) around the null value. The article also discusses considerations for setting the limits of a ROPE and emphasizes that analogous considerations apply to setting the decision thresholds for p values and Bayes factors. Figure 1 of the article. In everyday life and in science, people often gather data to estimate a value precisely enough to take action. We use sensory data to decide that a fruit is ripe enough to be tasty but not overripe—that the ripeness is “just right” (e.g., Kappel, Fisher-Fleming, & Hogue, 1995, 1996). Scientists measured the position of the planet Mercury (among other things) until the estimate of the parameter γ in competing theories of gravity was sufficiently close to 1.0 to accept general relativity for applied purposes (e.g., Will, 2014). These examples illustrate a method for decision making that I formalize in this article. 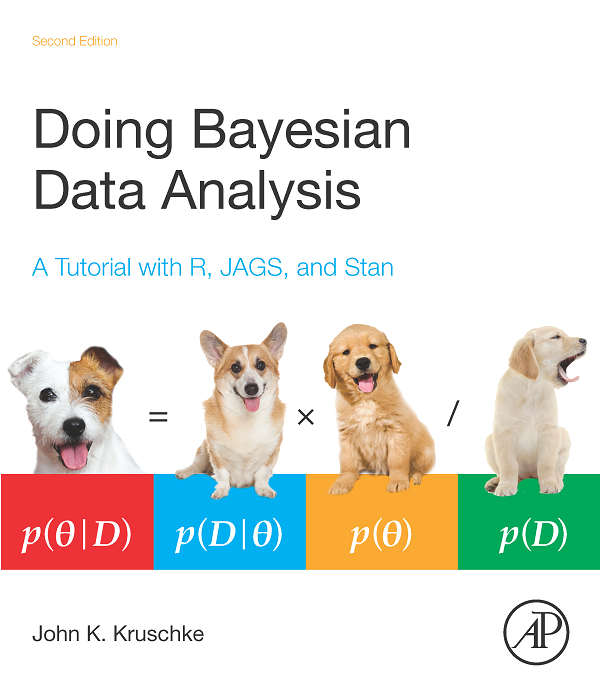 This method, which is based on Bayesian estimation of parameters, uses two key ingredients. The first ingredient is a summary of certainty about the measurement. Because data are noisy, a larger set of data provides greater certainty about the estimated value of measurement. Certainty is expressed by a confidence interval in frequentist statistics and by a highest density interval (HDI) in Bayesian statistics. The HDI summarizes the range of most credible values of a measurement. The second key ingredient in the decision method is a range of parameter values that is good enough for practical purposes. This range is called the region of practical equivalence (ROPE). The decision rule, which I refer to as the HDI+ROPE decision rule, is intuitively straightforward: If the entire HDI—that is, all the most credible values—falls within the ROPE, then accept the target value for practical purposes. 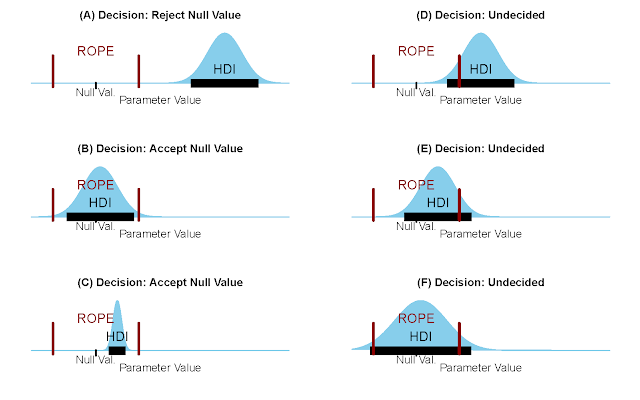 If the entire HDI falls outside the ROPE, then reject the target value. Otherwise, withhold a decision. In this article, I explain the HDI+ROPE decision rule and provide examples. I then discuss considerations for setting the limits of a ROPE and explain that similar considerations apply to setting the decision thresholds for p values and Bayes factors. The published article is available here (http://journals.sagepub.com/doi/full/10.1177/2515245918771304) and a pre-print version, with some differences in details, is available here (https://osf.io/s5vdy).